The small, common deer mouse can spread many diseases to human. Deer mice are nocturnal and often travel the same “paths” as other small mammals. They are excellent climbers and can access upper portions of buildings. Outdoors: Nests can be found in tree cavities, log piles, abandoned bird/squirrel nests and animal burrows. Indoors: Nests can be found in storage boxes, stuffed furniture, wall voids, structural corners and tight places in basements and attics. Deer mice feed twice a day at dawn and at dusk. They will store food for the winter in hollow logs and other protected places. Deer mice will stay within a ½-3 acre (0.2-1.2 hectares) radius. Once established around or in a structure, they will stay within 30 feet of their nest. Deer mice are rarely a problem in urban areas unless the buildings border wooded areas such as parks. They are common in farming/rural areas and rustic suburban areas. Deer mice are of medical concern because they are the primary carriers of hantavirus, which causes hantavirus pulmonary syndrome (HPS). The virus is transmitted via the inhalation of dust particles contaminated with the urine, feces or saliva from infected mice. HPS can cause severe respiratory distress and has the potential to be fatal if left untreated. Bi-colored, pale and grayish buff to deep reddish brown on top with white belly. 2 ¾-4 inches (7-10 centimeters), tail length measures 2-5 inches (5-13 centimeters). About 3/8-1 ¼ ounces (10.6-35.4 grams). Adult head and body length measures 2 ¾-4 inches (7-10 centimeters), tail length measures 2-5 inches (5-13 centimeters), and hind foot 5/8-1 inch (1.6-2.5 centimeters) long; weighing about 3/8-1 ¼ ounces (10.6-35.4 grams). Seeds, nuts, berries, small fruits, fungi, other small animals such as insects, centipedes, snails, slugs, dead mice and young birds. Females have three to five young per litter after a 21-24 day gestation period, and can have two to four litters per year. Reproduction peaks in the spring. The young reach sexual maturity at seven to eight weeks. Deer mice have many predators; therefore, their two-year life span may be shortened to as little as two months. 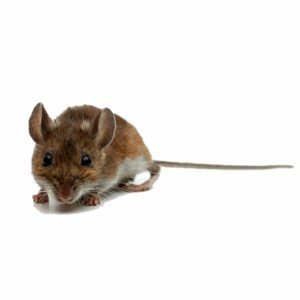 Deer mice are difficult to eliminate permanently indoors when they are abundant outdoors.